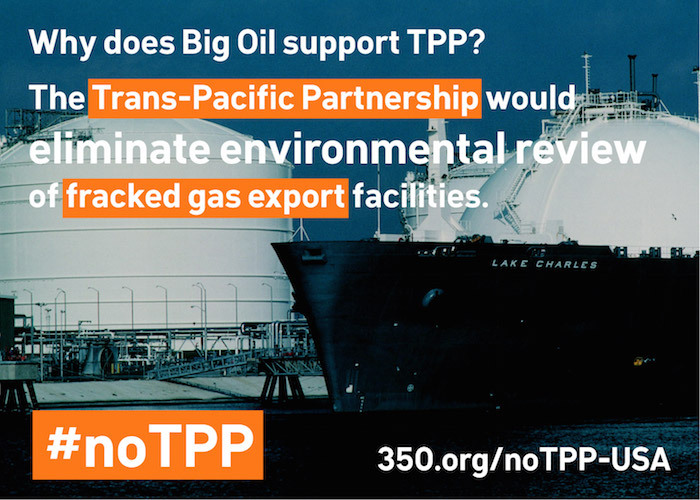 I oppose the Trans-Pacific Partnership because it is a threat to our climate and our democracy. Vote NO on Fast Track legislation that would allow this bad deal to move forward. The Trans-Pacific Partnership agreement -- a trade deal being negotiated between the US and dozens of other countries -- is the fossil fuel industry's latest tool to shut down climate action, and today begins a huge fight to stop it. The TPP would give foreign fossil fuel corporations the right to sue city, state and national governments if climate action hurts their profits. It would also eliminate environmental reviews of fracked gas export facilities that would make Big Oil billions of dollars. Legislation that would allow the TPP to pass, called Fast Track, faces a close vote in Congress -- if enough Members of Congress come out against this plan in the next few weeks, it stops it in its tracks. Can you send a message to your members of Congress now to stop the TPP? "The Trans-Pacific Partnership clause everyone should oppose" Sen. Elizabeth Warren, Washington Post, Feb. 25th 2015.